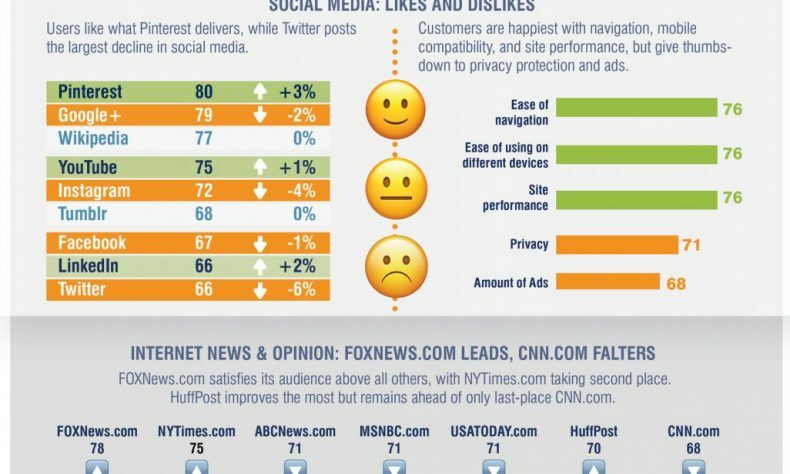 ANN ARBOR — Facebook, LinkedIn, and Twitter have the least satisfied users in social media, according to the latest data from the American Customer Satisfaction Index 2018 E-Business Report. Customer satisfaction with social media as a whole fell 1.4 percent to a score of 72 on the ACSI’s 100-point scale, ranking it among the bottom five of all industries measured by ACSI, and the lowest of the three e-business categories. 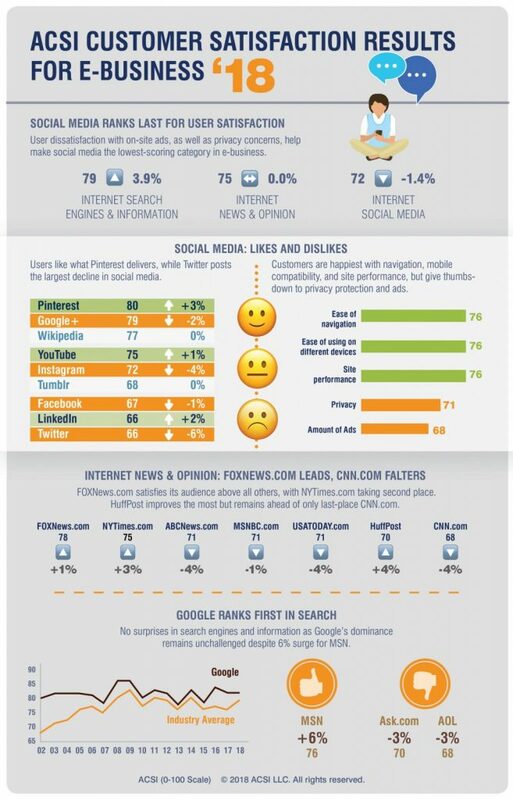 The other two categories fared better: Internet news and opinion held steady at 75, while internet search engines and information climbed 3.9 percent to a score of 79. Pinterest’s privacy protection is ranked best in class, tied with Google+, which dropped 2 percent for a second-place score of 79. Wikipedia stood unchanged at 77 in third place, far above the industry average. YouTube advancedd 1 percent to an ACSI score of 75, buoyed by its video speed, which users rate as the best in social media, and upgrades that improved live streaming. Instagram fell 4 percent to 72 as users reported declining site performance, outdated content, and more intrusive ads. It remains to be seen how the recently launched IGTV will affect customer satisfaction. Tumblr was unchanged at 68, a point above Facebook, which slipped 1 percent to 67 in the wake of its data privacy scandal. Users rate Facebook’s privacy protection as the worst in social media, its ads as the most intrusive, its navigation and video speed poor, and its content stale. LinkedIn, one of the few gainers, rose 2 percent to 66, but still sits tied in last place with Twitter. Twitter’s 6 percent plunge in user satisfaction was the biggest drop in the category, fueled by fake accounts, bots, abusive content, misinformation, and other far-reaching woes. Overall, social media sites have improved mobile compatibility (up 1 percent to 76) and receive high scores for ease of navigation (76). But privacy protection is lacking: Its score drops 1 percent to match its all-time low of 71. The amount of ads on sites receive an all-time-low score of 68, after a 1 percent drop that reflects users’ increasing unhappiness. FoxNews.com retains first place among internet news and opinion sites, rising 1 percent to 78. The site meets its readers’ high expectations and its audience is more loyal and much more likely to recommend it than readers of any other site. NYTimes.com also improved, climbing 3 percent to 75. While readers’ expectations are just as high as FoxNews.com’s, NYTimes.com readers are less loyal and more likely to get their news from other sources as well. ABCNews.com and USAToday.com both fell 4 percent to match MSNBC.com (down 1 percent) at 71, far below average. While HuffPost is the most improved, gaining 4 percent, its ACSI score of 70 places it above only CNN.com, which fell 4 percent to a last-place score of 68. Satisfaction with nearly every aspect of online news fell over the past year: Freshness of content, ease of navigation, site performance, and mobile compatibility all drop 1 percent, while speed and reliability of video clips dipped 3 percent. The one bright spot is the amount of ads on site, which is slightly better than last year – up 1 percent to 67 – but still the lowest measured benchmark. MSN rose 6 percent to a 76, largely the result of user satisfaction with the many features and services on its homepage. Microsoft’s Bing search engine remains unchanged at 73. Yahoo! gained 1 percent to 74, a far cry from its high score of 80 in 2005. Ask.com fell 3 percent to 70, followed by Answers.com (up 1 percent to 69), which announced it will no longer accept questions, but existing content will be archived. AOL continued to lag the industry, dropping 3 percent to 68. Search engines improved in nearly every aspect. Navigation is easier (up 5 percent to 83), site performance is better (up 5 percent to 82), and there’s a wider variety of services and information (up 4 percent to 82). Ease of use on all devices improved (up 7 percent to 81), content is more up to date (up 4 percent to 81), videos perform better (up 7 percent to 80), and even the amount of ads is more tolerable compared to a year ago, rising 6 percent to a score of 70. The ACSI E-Business Report 2018 is based on 5,169 customer surveys collected between July 18, 2017 and June 28, 2018. The full report is available for download at this link. The American Customer Satisfaction Index (ACSI) has been a national economic indicator for almost 25 years. It measures and analyzes customer satisfaction with more than 380 companies in 46 industries and 10 economic sectors, including various services of federal and local government agencies. Reported on a scale of 0 to 100, ACSI scores are based on data from interviews with roughly 250,000 customers annually. For more information, visit www.theacsi.org.